The winter months in the golfing season are all about putting hours in on the driving range. Let’s be honest, British winters aren’t the kindest weather wise and by the time you finish work it will most likely to be dark leaving nowhere else to go but the driving range. With no competitions to affect your handicap, now is the perfect time to make changes to your swing. Obviously, if you were a serious golfer then you would also spend the winter putting hours in at the gym but for most amateurs a nice refreshing beer at home after work is more preferable. But, just because you don’t want to leave the house doesn’t mean you can’t practice. There are many golf aids out there that allow you to perfect your game at home. So, here are six training aids you should try this winter to become better every shot. If you can master the backswing then you will load and store more power to be unleashed on the golf ball resulting in effortless distance. The Sure-Set golf training aid teaches you how to perfect the move of the backswing by setting the club in the correct loaded position with great swing width, on the right plane with the right angles. The blend of wrist hinge, forearm rotation and shoulder turn, as you coil around a solid foundation is what makes a perfect backswing that is filled with power. Sure-Set makes perfecting this movement easy and in just a few practice drills you will learn one of the most important movements in the golf swing. It works just like stabilisers on a bike. You learn to ride with the assistance of the extra wheels and then when you take them off a few weeks later, you can ride a bike no problem. Practice setting your swing correctly by making a few back swings with the Sure-Set then follow them up by making a swing with an actual club. Almost effortlessly you will make the perfect backswing. The Wellstance helps you develop your swing by being perfectly lined up to your target as well as helping you gain efficiency in power and precision through its easy to use system for all levels of golfer. Available in both right handed and left handed models, Wellstance will rapidly become an essential tool for weekly practice sessions. Wellstance is the simple way to make sure all your positioning is correct, as well as your shoulder alignment and width of stance. With all of the above set up correctly, you will be able to increase the power in the swing, which will lead to greater distance and precision as well as better ball striking. If you don’t want to go outside in the cold, wind and rain then you can always do some practice in the warmth of your home with the Pro-Infinity Putting Mat. This advanced putting green has 4 different putting speeds, a true-roll surface and movable foam wedges to vary the mats putting angles. 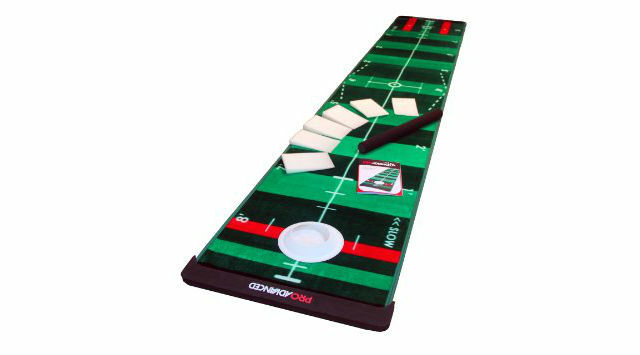 It also comes with a life-like silicon hole that can be moved to anywhere on the putting mat to vary your practice. 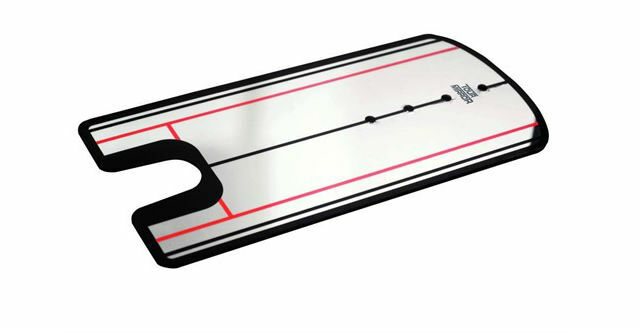 The most impressive feature of this putting mat is the line the ball leaves after each putt, which allows you to analyse your putt and the roll on the ball. The Pro-Infinity also comes with an eraser to get rid of the line left on the mat after the putt. This is one of the best putting mats available on the market and will help you improve the feel, alignment and consistency of your putting stroke. The 4 speeds vary from 8 (your typical green speed) to 12.5 (Masters Tournament green speed). The speed depends on whether the polyester fiber has been brushed high or flat with the supplied mat roller. You can choose to put in the direction of the fiber or against it. The 6 foam wedges supplied mean you can change the break in your putt. The Tour Mirror training aid is a simple but effective way to improve your set up over a putt. The mirror lets you correct any faults in shoulder and eye position over the putt. This is done by simply lining your shoulders up with one of the lines on the mirror which, in turn, should mean your eyes are set in the right position, over the ball. You can double-check this on the mirror. This training aid is easy to use and can be used anywhere from on the putting green to your living room on a cold, dark winters night. As it is not a large training aid it is easily transferable between home and the golf course. This simply but effective training aid will have you putting a more consistent stroke on the ball in no time. If you’re looking to really splash the cash this winter then the Swing Caddie SC100 Launch Monitor is a definite purchase. 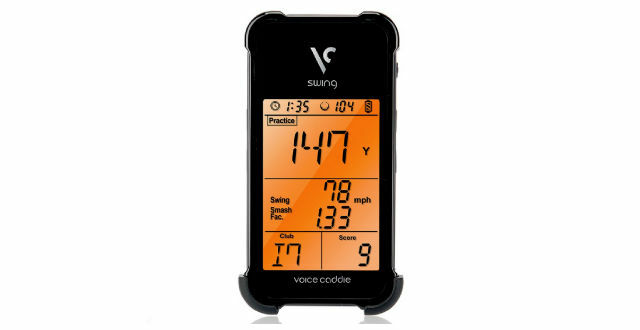 The Swing Caddie SC100 is a standalone portable golf launch monitor designed to help golfers visualise their swings. You may even mistake this device for an iPhone, which is a complete contrast to the launch monitors you see professionals using. This launch monitor provides instantaneous feedback without any separate device or smart phone application. The Swing Caddie will measure carry distance, swing speed, ball speed and smash factor and can be used in three different modes; practice mode, target mode and random mode. After your practice session has finished you can then look back at the stats for the certain clubs you used and form a greater understanding of the dynamics of your golf swing. As it is only a small device it is easy to carry round with you and can even be used on the course. As mentioned earlier, this device doesn’t come cheap as retail is set at £220 but if you really want to get serious with your game then this will definitely be money well spent. Every golfer knows how you set up and address the ball is a fundamental part of the golf swing. 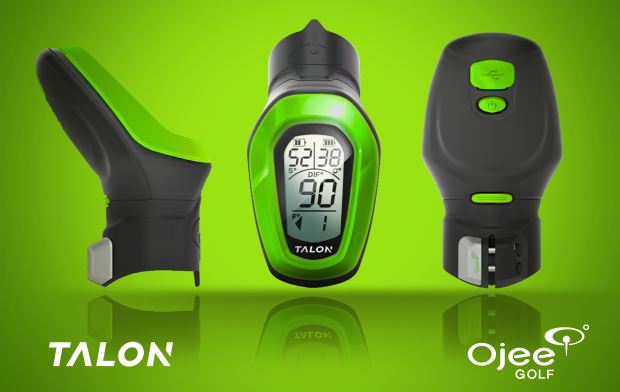 Talon by Ojee Golf is a digital device that fits easily to the grip of your club. Using patent-pending technology, it delivers real-time quantified, visual feedback on your angles of address. Talon allows you to set up to the ball correctly every time, which ultimately improves muscle memory and consistency that offers you optimum performance. This is done by showing your spine angle, shaft angle, club shaft to spine angle and rotation angle on the device’s screen, which is made possible by use of a back unit that is worn as a belt. The Talon makes perfecting the basics simple. It is innovative, exciting, and it may just be assist in improving your game, allowing you to hit better and more consistent shots, which will yield lower scores. Whether it is in your home, on the course or at the driving range on a cold winters night, these training aids will most definitely improve your game and make you better every shot.